Submitted. Drivers are being urged to take extra precautions around large trucks to reduce crashes that result in a significant number of fatalities each year in British Columbia. The province-wide campaign launched Tuesday, October 17th. The Be Truck Aware campaign, led by an alliance of B.C. road safety stakeholders, coincides with Operation Safe Driver week, a continent-wide initiative in which police and commercial vehicle safety and enforcement (CVSE) officers will be ticketing drivers of both cars and trucks for failing to share the road and follow safe driving practices. One-in-five traffic fatalities in B.C. occur in crashes involving large commercial vehicles. Across North America, studies have shown that in car-truck crashes, occupants of the passenger vehicle are at far greater risk of being killed than the driver of the truck and that the majority of fatal car-truck crashes are caused by passenger vehicle drivers. * Leave space: Large trucks need extra room to stop and to turn. Don’t take away their turning or braking room. 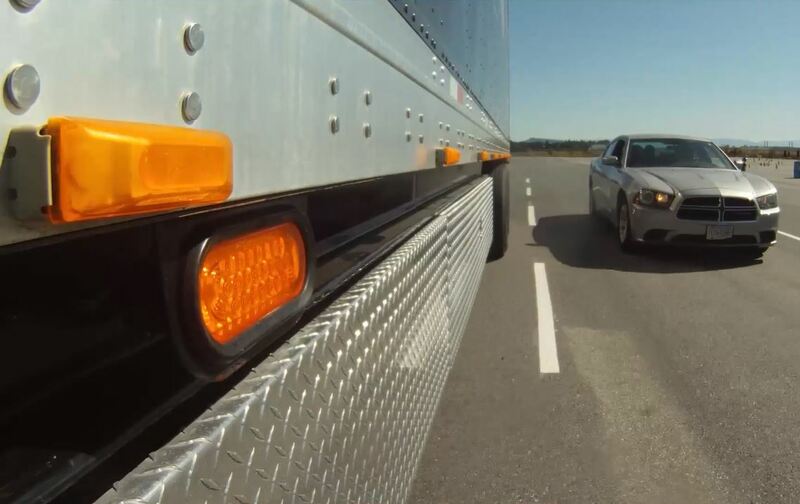 * Don’t merge too soon: When passing a truck, make sure you can see both its headlights in your rear-view mirror before merging back into the lane. If you merge too soon, the truck driver may not see you or be able to stop in time to avoid a crash. * Be visible around trucks: Either slow down or move well ahead of large trucks to stay out of the truck driver’s blind spots. * Anticipate wide turns: Watch for trucks making wide swings to turn right. Never drive ahead in the right lane beside a turning truck. * Ensure brakes and tires are in top condition to minimize stopping distances. * Adjust speed and driving in poor weather and road conditions. * Stay sharp and focused by getting plenty of rest and eliminating in-cab distractions. * Make sure loads are well-balanced and secure to reduce the likelihood of a crash and its impact on others. Be Truck Aware is a campaign delivered as part of B.C.’s Road Safety Strategy. Alliance members include RoadSafetyBC, ICBC, WorkSafeBC, the Justice Institute of British Columbia, RCMP, Commercial Vehicle Safety and Enforcement (CVSE), Teamsters Local 31, BC Trucking Association and Safety Driven – the Trucking Safety Council of BC. The campaign will run from Oct. 17 to 31, 2017. * In an average year in B.C., large trucks are involved in less than 1% of all crashes – but they’re involved in nearly 20% of fatal crashes. * On average, between 2011 and 2015, 285 people were killed each year on B.C.’s roads and highways, 61 of them in crashes involving at least one large commercial vehicle. * A survey of B.C. drivers conducted for the Be Truck Aware Alliance in June 2017 found that 80% of drivers surveyed claim to know how to drive safely around large trucks, but over 40% don’t always drive that way. Nearly one-third of drivers surveyed say they feel nervous driving around big trucks all or most of the time. * Additional studies show that in fatal car-truck collisions, two-thirds or more of the incidents are found to be the fault of the passenger vehicle. * A fully loaded transport truck travelling at 65 km/h takes 36% longer to brake and stop than a passenger car travelling at the same speed. A fully loaded transport truck travelling at 105 km/h takes 66% longer to brake and stop than a passenger car travelling at the same speed.